Why you need this book! A literary work created exclusively to reveal a unique language, a language filled with flair, color, intensity and raw emotion. This book is an in depth look into one of the most intriguing sporting languages inexistence today. The Boxing Dictionary: definitely one of a kind, and an unparalleled tribute to the sport. I am NOT a fighter, nor am I a former fighter, at least not a professional fighter. For me, boxing fulfilled a very important part of life, more a rite of passage; from child to manhood, as I had to prove myself in the ring while growing up in the part of New York I was born and raised in. Again, all learned in the ring of a small gym, situated in an economically... Read More! Curious what this book is all about? 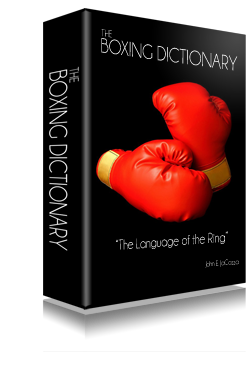 Read a quick sample to get an idea of of what The Boxing Dictionary is all about! Read Now! or read the Press Release. Already own The Boxing Dictionary? © 2013 The Official Site of 'The Boxing Dictionary' | Another great book published by The Cow Pie Press . ALL sales final | NO returns | NO international sales at this time | Applicable sales tax to all Vermont residents.